Learn how to set up a 1099 vendor and print 1099/1096 forms in QuickBooks Desktop. Before setting up a 1099 vendor in QuickBooks Desktop, check the IRS guidelines. This will tell you if your vendor falls under the Independent Contractor category. Note: The Print 1099s/1096 option appears only when you activate the 1099 miscellaneous feature in QuickBooks Desktop. Select Edit and then Preferences on the Toolbar. From the left select Tax: 1099. Next to Do you file 1099-MISC forms? select Yes. Select OK to save the preference. Select Vendors and then Vendor Center on the Toolbar. Select the New Vendor drop-down arrow and choose New Vendor. On each tab, enter information as needed. You can edit the vendor to add more information later. Right click on a vendor's name and then select Edit Vendor. Select the Address Info tab and validate the data. Make sure the Address field contains the appropriate two-letter state abbreviation and the correct ZIP code. If the vendor is a person, the vendor's legal name should appear in the First Name, M.I., and Last Name fields. If you know the company name but not the person's name, leave the Company Name field blank to prevent double names from appearing on the 1099-MISC form. Select the Tax Settings tab. Checkmark the Vendor eligible for 1099. Enter the vendor's tax identification number in the Vendor Tax ID field. Select OK.
Repeat steps 2 through 6 for each 1099-eligible vendor. Choose an 1099-MISC box for each account listed or choose Omit these payments from 1099. Select Save & Close once the accounts have been mapped. To print forms 1099/1096 you must be in single-user mode, and must have pre-printed 1099 and 1096 forms to do this. You also have the option to e-file your 1099 forms to the IRS. Use the QuickBooks Desktop 1099 Wizard to verify all your 1099 information. 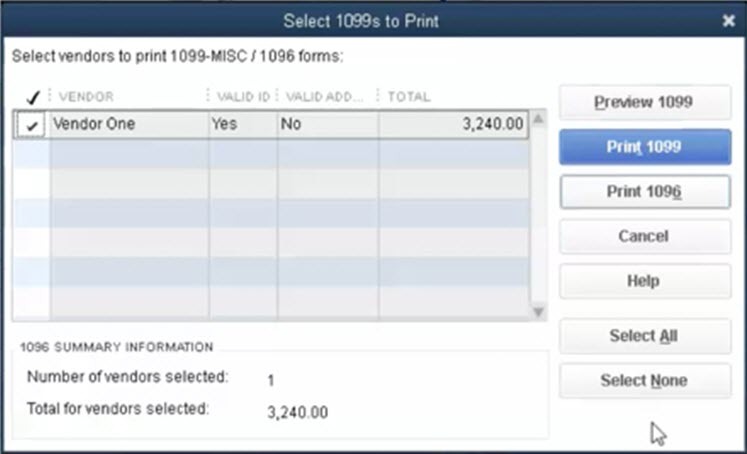 In the QuickBooks Desktop 1099 Wizard, at Step 6: Choose a filing method, select Print 1099s. (Note: After selecting Print 1099s, Wisconsin customers are presented with the following message. After reading the message, select OK to proceed through the print flow. 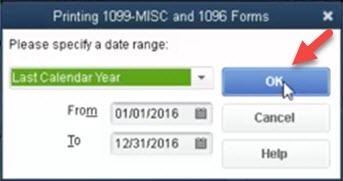 Select the date range from which the 1099s were paid and select OK. Select the 1099(s) or 1096(s) you want to print and select the Print 1099 or Print 1096 button accordingly. After you have previewed, you can then select the Print 1099 button to print the 1099 or the Print 1096 button to print the 1096. If you have a page-oriented printer, it's simpler to print copies separately than all at once. Do not collate your preprinted forms before putting them into the printer. Instead, start by loading all the Copy 1 forms. After you have printed all the Copy 1 forms for each vendor, load and print the Copy 2 forms. Copy A (nonperforated) is for the IRS. Copy B (perforated) is for the vendors. Each page prints 2 vendors per page. Alignment will ask you to select -1 to bring the print down or +1 to bring the print up. This will lower or raise the print 1/100th of an inch. You can opt to e-file forms. You may use our 1099 E-File Service to file your 1099 and 1096 forms electronically from QuickBooks Desktop. How will Vendor and Company names appear on 1099-MISC forms? Vendor Name is blank and the Company Name has a value in QuickBooks Desktop The Vendor Name cannot be blank (an error will appear). However, you can specify the Vendor Name and leave the Full Name fields blank. In this case, only the Company Name will be displayed on the 1099-MISC Form. Vendor Name, Company Name and Full Name fields are all different in QuickBooks Desktop Only the Full Name and Company Name will be displayed on the 1099-MISC Form, the Vendor Name will be ignored. Note: Vendor Name is auto-populated with the information provided in the Full Name fields, unless the Vendor Name is manually changed. What envelopes do I use for Form 1099? 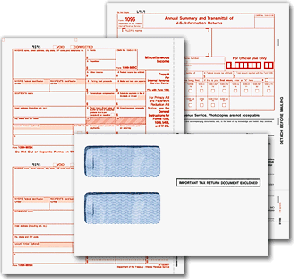 Intuit offers 1099 Forms (2 per sheet) with size 8 x 11 inclusive of compatible double-window envelopes with size 5 5/8'' x 8 3/4" that are compatible with all versions except 2010 and earlier. If printing from QuickBooks Online, compatible with QuickBooks Online Plus only. You can order the forms and envelopes. Contractors or vendors must receive copy of their 1099-Misc form on January 31, 2019. Due date is extended if you are reporting in boxes 8 or 14. Public Law 114-113 requires Form 1099-MISC to be filed with the IRS on or before January 31, 2019, when you are reporting non-employee compensation payments in box 7 (this applies for BOTH paper and electronic filing). File Copy A of the 1099-MISC form with the IRS by February 28, 2019. If you file electronically, the due date is April 1, 2019. Does Assisted Payroll support filing of 1099/1096 forms with IRS? No. Assisted Payroll does not support filing of 1099/106 forms. The fastest way to file your 1099/1096 forms from QuickBooks Desktop is by using our 1099 E-File Service.